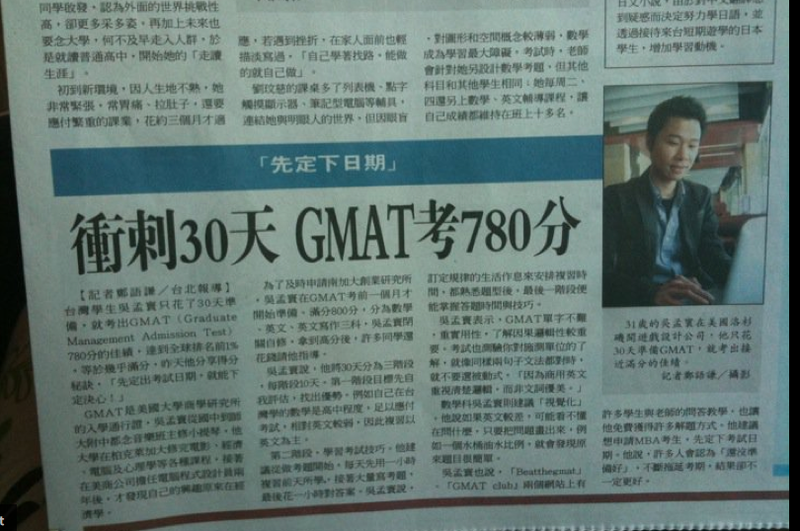 This week Brandon was asked to give an interview about his high GMAT score to United Daily news – the biggest paper in Taiwan! His advice is well known by now – get that test booked, and once you have the date on your calendar, study smart and stay focused. Don’t spend months and months learning and relearning the same things, condense your studies and with the right study plan and lots of Official Guide practice tests, you can improve your score rapidly and effectively. I don’t have to remind you that he scored a 780 with just 30 days of study. Brandon will be in Taipei until the end of April before flying back to Los Angeles.